The numerous passages and islands between Kavieng, the Northern tip of New Ireland, and New Hanover to the West make for some of the most pristine, diverse and exciting diving in Papua New Guinea. Experience the thrill of close encounters with big pelagics in the current-swept passages. Enjoy the relaxing feeling of drifting along plunging walls decorated with colourful corals and fans. Explore World War II wrecks! On the Southwest coast (Bismarck Sea) the reefs drop precipitously, forming dramatic drop offs and offering exciting dives at passage entrances. The Northern and North Eastern coasts (Pacific) have gradually sloping seabeds and extensive systems of offshore reefs. For the wreck enthusiasts there are many World War II wrecks, in particular seaplanes, which are scattered in and around Kavieng harbour. Diving is enjoyed all year round and is suitable for all experience levels and interests. The water temperature is always warm and rarely drops below 28°C. April to July and September to November have proven to provide good all round weather and dive conditions. To plan your dive trip to coincide with the incoming currents at the passages, to insure the best of the Big Fish Action please Contact Us and indicate rough dates so we can best advise. Scuba Ventures located on Nusa Parade Road, which runs along the Nusa Harbour waterfront. – 2min drive from the Malagan Beach Resort, 1min boat ride to Nusa, 1 min drive to the Peter Tarot centre, 2min to the Kavieng Club/Hotel. Transfers from accommodation facilities are arranged free of charge. Scuba Ventures has three Dive Boats, each equipped with full safety gear, suncover and ladder seat for easy boat entry. Emphasis is on small group uncrowded diving for better enjoyment and safety. Cater to a Maximum 22 divers per day. A full range of dive courses is available. Snorkelling excursions are also available subject to space availability on the dive boats. Scuba Ventures boats departs at 0815 daily for two morning dives. (Pick up times if applicable are advised beforehand ). 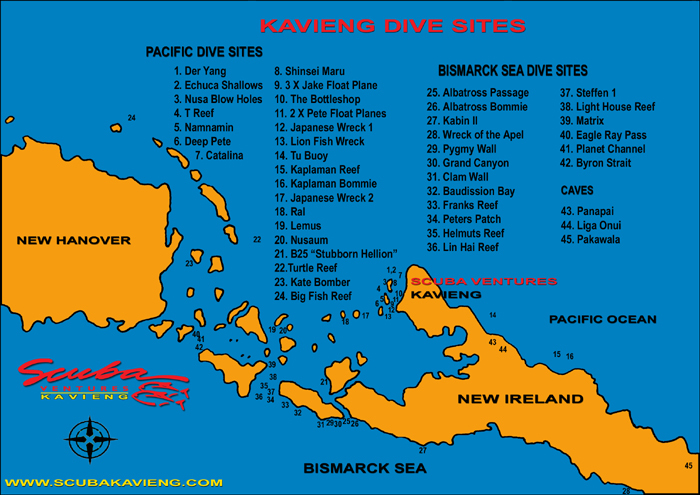 There is wide variety of Dives to choose from. Sites dived are planned according to divers interest, experience and weather conditions. All Dives are guided, air cylinders and weights are provided and a full range of Oceanic Hire Gear is available for hire. Light snacks, fresh tropical fruit, coconut and biscuits are provided between dives. We return from the mornings dives at 12:30 -13:30 and can plan afternoon dives or night dives as requested. Dive gear is stored and washed by Scuba Ventures for your convenience. Mesh bags are provided for Fins and Masks. All personal gear, weightbelts and tanks are loaded onto the boat each morning by Scuba Ventures staff. Nitrox is on offer for those that would like to advantage from its benefits. less fatigue, extended bottom times, more options for third dives, better safety. For those that are not NITROX qualified we can provide a Discover Nitrox introduction or an Enriched Air Diver specialty. Aim to maintain Kavieng’s Reefs in its most pristine condition. Not remove anything from the wrecks or reefs. Adhere to normal safe diving practices regarding buoyancy control, air supply (finish a dive with 50 bar remaining), ascent rates, safety stops, dive profiles etc. Use of a Dive computer is highly recommended. Listen carefully to all Dive briefings.